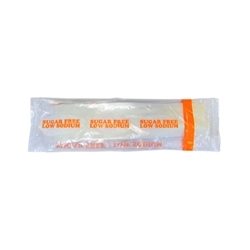 Med-Diet Orange Hospital Pouch Dietary Kits are ideal for an individual on a sugar free/low sodium diet. It is fitted with 1 sugar substitute, 1 perfect seasons, 1 pepper, 1 flex straw and 1-2 ply 13"x17" napkin. Each kit is individually wrapped to ensure a safe and accurate traytop setting with color coded diet indicators that improve trayline efficiency and nutritional accuracy for the patient. Pepper - Contains Pure Black Pepper. Perfect Seasons - Spices, Dehydrated Onion, Dehydrated Garlic, Ancho Pepper, Spice Extractives.